You know how spring cleaning typically starts in March or so? Yeah... we're ahead of schedule. I've been sorting through a lot of our stuff and have been dividing things among three piles - keep, trash, and donate. In fact, I feel like I've been doing this every 3 months of so just to really take inventory of what we have and remove stuff that we don't need/want/use. It's been refreshing to say the least. But the biggest challenge of the whole process is managing all the culinary/kitchenware stuff I have.. and it's a lot. Too much. So much so, that I had to take up a spare bedroom and transform it into my 'kitchen closet' full of anything and everything culinary related that doesn't fit into my kitchen. Most of the items in my kitchen closet is justified, with the various culinary classes I teach and all the entertaining I do. But looking at it all encouraged me to think about the items I absolutely need in my main home kitchen. A majority of my culinary items are stored away, but in my everyday kitchen, I have some select essentials that I use week in and week out. So if you've got some holiday gift cards to burn and/or need to update your kitchen with new digs, this post is for you! Below are my 10 fave "kitchen essentials"... what are yours? Wusthof Classic 7-Inch Santoku Knife - This is my go to knife for a majority of tasks. The length is comfortable with great balance and weight for me. It's also extremely sharp, ready for any job I need it for. As a result, It's a great all purpose knife and I can't live without it! 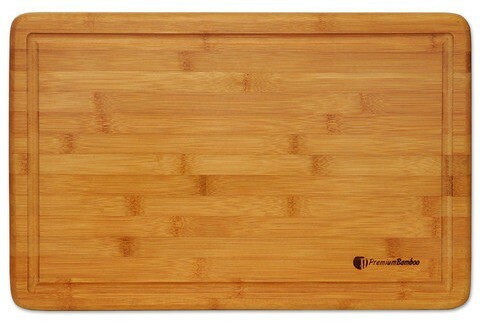 Premium Bamboo Cutting Board - I have a few different cutting boards (wood, plastic, flexible, etc) but I especially like my bamboo one because it's so big. Aside from the great chopping space it provides, I also like using it (actually two of them) over my stove burners to create more counter space when I entertain. Breville Smart Oven Convection Toaster Oven - This appliance is used daily in my kitchen. Don't let the idea that it's a toaster oven fool you! It's big enough to handle way more than toast and we use it far more than we use our standard kitchen oven. First off, it's convection, so everything cooks roughly 25% faster than the typical time. It is an ideal size that can even fit a 12 inch frozen pizza. We've baked everything from pizza, roast chicken, lasagna, cookies, etc in this, oh, and toast lol. And should it ever break down, I will not hesitate buying another one to replace it! Nordic Ware Compact Ovenware - To go along with our toaster oven, we also have a set of ovenware that we use often. 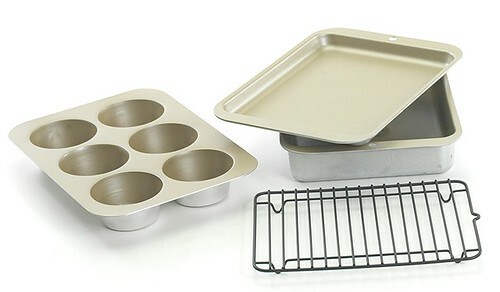 Cookie sheets, muffin pans, baking pans, etc are a must for our kitchen so we can use them in our toaster oven. The best part is that because it's compact, we can make just enough for our family of three. 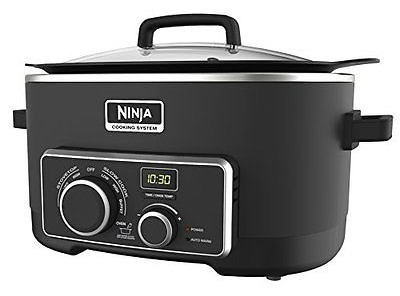 Ninja 3-1 Cooking System - Crockpots are especially popular these days because it's easy to 'fix it & forget it'. I love crockpots myself, but I have to say I love my Ninja 3 in 1 Cooking System more. It's like a super upgraded crockpot with the ability to steam, roast and bake in addition to the usual slow cooker functions. (In fact, my Beer Braised Corned Beef is slow cooking in it as I type this!) This system has even helped Patrick make dinner on busy weeknights when I'm working late by making it easy for him to use, heat up items, use as a skillet or place ingredients and make a crockpot meal that slow cooks until I get home for dinner. 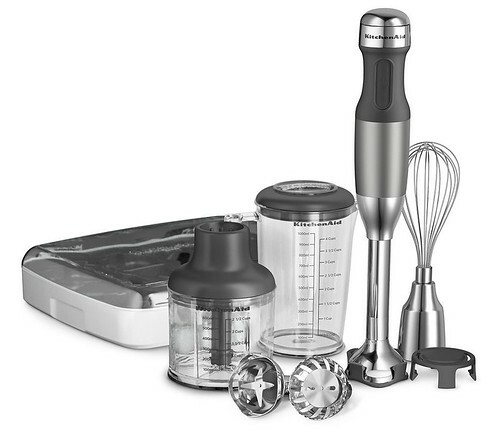 KitchenAid Immersion Blender - I have a blender (VitaMix) but although its great, powerful and does wonders, it's just too big and clunky. Instead, I like using my immersion blender more often and it does a fine job for a majority of my blending needs. It's also pretty useful making blended soups right in the pot, whipping up things quickly without lugging out the stand mixer and overall, I like the multi-functionality and ease. Oh, and it's nuch easier to clean than the other small appliances! 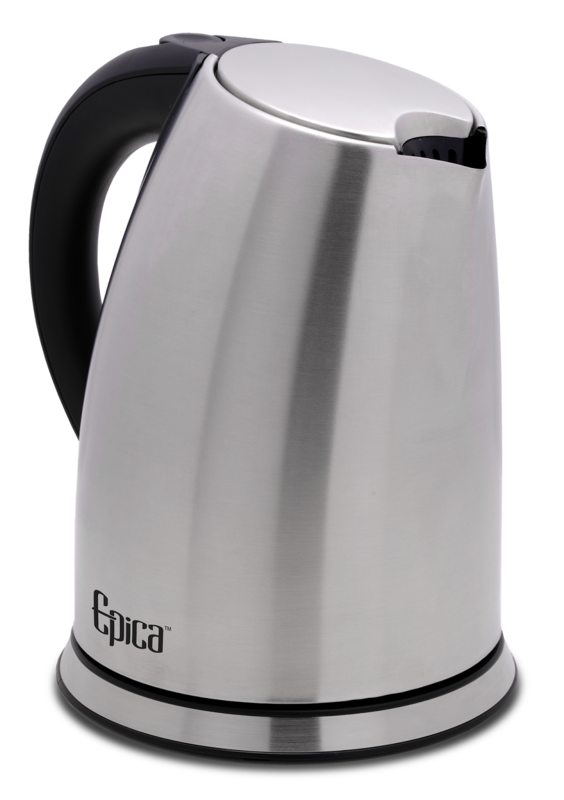 Epica Water Kettle - I love my coffee but I got rid of my coffee maker a long time ago. Instead, I freshly grind my coffee beans and use a French Press. That's where my water kettle comes in. It heats up nearly 2 quarts of water in less than 2 minutes and my coffee is only a satisfying press away. I love that it heats up so much water so quickly - faster than doing it in the microwave or stovetop. Some of my fave features include the automatic shut off and the adjustable cord is stored in the base. Calphalon 10" & 12" Non Stick Omelette Pans - Of these two, I use the 12" far more and usually its for something other than omelettes. I like the 12" for its size and it's a good weight for me to hand - not too heavy and not to flimsy. It's sturdy and solid... and I probably use it 5 days out of the week for something. Definitely a must have in my kitchen. Nordic Ware Microwave Rice Cooker - Sounds odd, but yes... you can make rice in the microwave! 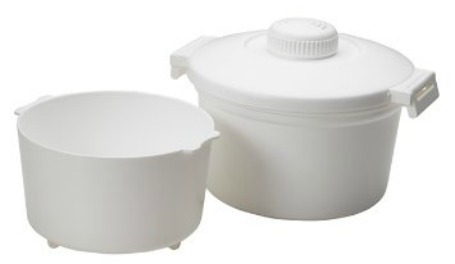 Growing up as a kid, we had a huge rice cooker to feed our family of 5. But since it's just 3 of us at home, there was no need for the same fancy rice cooker my mom had. It wasn't until I went away to college that I realized I could make rice in the microwave. And ever since then, a microwaveable rice cooker was part of my kitchen arsenal. Aside from rice, the cooker makes for a great vessel to transport soups, stews an chilis for potlucks. And I love that it can go from microwave, fridge and even dishwasher - win! 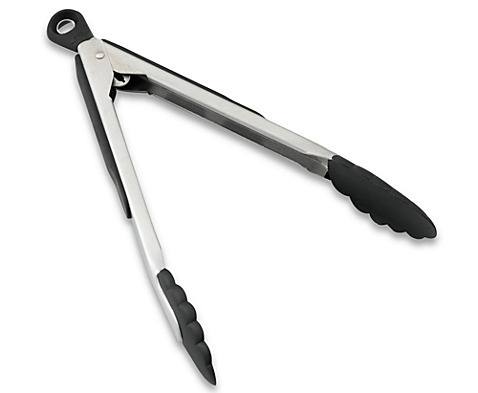 OXO 9" & 12" Locking Tongs - These are a must in my kitchen. Aside from the common uses, I use them often for reaching things lol. Being 5 feet tall has its challenges in the kitchen, but these tongs make it easy for me to reach things on high shelves when Patrick isn't around and I'm just too lazy to grab the step stool. The tongs make for a great arm extender!